You couldn’t have asked for better weather in Las Vegas that weekend. The sunny 93 degree desert air was magnificent – A full 60 plus degrees difference from home just 24 hours prior… I walked into The Palms and made my way into the ultra-cool state of the art Pearl Theatre. You could feel the anticipation growing as the 2200 sold-out crowd settled into their seats. The show started promptly at 8:00 PM to much surprise of the people still rolling into the theater. No opening act for this gig. Dressed in a full white suit (only in Vegas could he get away with wearing it, Bonamassa would later say) he sat down and treated the fans to a 30 minute acoustic set. Along with drummer/percussionist Tal Bergman and keyboardist Arlan Schierbaum, the evening began with his cover version of Bad Company’s “Seagull.” The set continued with “Jelly Roll”, “Jockey Full of Bourbon,” and then “Athens to Athens,” before concluding with “Woke up Dreaming.” Anyone familiar with Joe’s latest release An Acoustic Evening at The Vienna Opera House would’ve been delighted to witness this extraordinary acoustic opening set. It was a very classy way to start a show indeed. The acoustic piano and bongos were promptly removed and a gush of light hammered the audience with the opening chords of “Slow Train.” The infectious thick bluesy groove (with Carmine Rojas now joining in on bass) really got the crowd going. Bonamassa showed he was more than just a superb guitarist. Unlike many guitar aficionados, he also has a great voice that keeps getting better. Bonamassa then worked through an additional two hours of material. From “Dustbowl” to “Dislocated Boy,” “Driving Towards the Daylight,” “Who’s Been Talking,” “Mountain Time,” “Young Man Blues,” and “The Ballad of John Henry,” Bonamassa executed masterfully; using each song to showcase a different guitar from his vast collection. It’s easy to see why people who are familiar with Bonamassa compare him to guitar legends of the past. At 36-years-old (this Wednesday May 8th) the Utica New York native is known by some as an amalgamated version of his largely British blues-rock influences. Bonamassa never hides this fact and occasionally during the show will pay tribute to his idols by weaving the odd Led Zeppelin or Cream guitar lick into his repertoire. Each member of his band contributed equally, but the distinctive growling sound of the Hammond B3 organ for many of the tunes, as well as Bergman’s incredible drum solo were particularly memorable. Not exactly a newcomer to the Palms, Bonamassa has recorded two studio albums at the resort’s recording facility. The voyage of creating the album “Driving Towards the Daylight” was documented in a video series Bonamassa released last year. He will also be recording his next album at the facility. Joe Bonamassa and his band came back for a two song encore: “Sloe Gin” and then wrapped up the evening with a barn burner version of ZZ Top’s “Just Got Paid.” There were several well deserved standing ovations throughout the evening. The first words I heard from the people around me as the lights came up was a speechless awesome inspired, “Wow…” I couldn’t have agreed more. When I first started The Blues Blogger back in 2007, I used classic blues tunes I heard my brother and his band play as a soundtrack to recalling my past experiences. I was constantly being emailed about Joe Bonamassa by many of my readers. It didn’t take long for me to be intrigued. Perhaps, (I thought back then) my blog didn’t have to be all about the past, but it could also be about current musicians whose influences came from some of the great legendary artists of our time. Since then I’ve enjoyed listening to Joe Bonamassa play over the years and I’ve featured Joe now four times on my site. I’ve gained tremendous respect for him and feel very fortunate to be able to see him perform live. 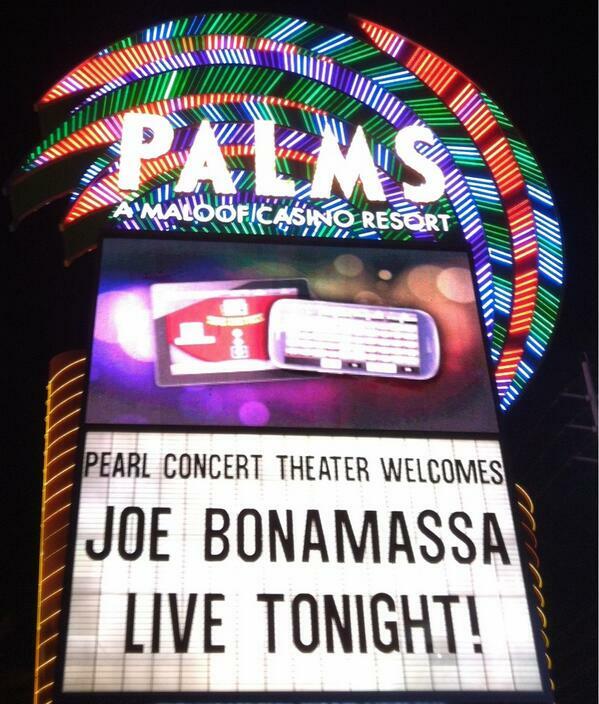 Bonamassa is an artist you definitely do not want to miss when he comes to your area. I know I’ll be keeping an eye on his tour schedule; waiting for the chance to see him again. What about you? Are you familiar with Joe Bonamassa? Have you seen him perform live before? Perhaps you were at The Las Vegas show at The Pearl as well? Or part of the Bona-Vegas weekend? Or maybe you just want to wish Joe a “Happy 36th Birthday” this Wednesday May 8th? Please include your thoughts or comments in the area below. My wife and I made a special trip to Vancouver on April 10th to see Joe at the Orpheum Theatre.. I have a lot his music including his newest one. The show was spectacular and yes WOW was the word used most to describe his show..It was worth the trip for sure.. Yes, I have seen him OZ at the Byron Bay Blues Festival a couple of years ago now but I remember it well & WOW, he just gets better. I too heard of him back in, 2006-7. Back then I bought some CDs through Amazon and was blown away, how could he be so young and yet be so good! His work with Beth Hart breaks new ground too. I think he has done a second album with her? He has mastered so many styles now and yet he just keeps, adapting, learning and Improving, a true Legend. Joe Bonamassa. “Wow”s indeed – what a superb musician. I am rarely unmoved listening to his songs. Besides the sheer virtuosity of his playing, it is the ease with which he swaps between musical genres that is astounding. He seems born to each style. Even his vocals are not typical of any one style, but sound natural to each. I don’t often give such accolades, but I think in years to come Joe Bonamassa will be seen as one of the true “Greats”. To illustrate the breadth of his playing styles, what about the following; the blues of Your Funeral, My Trial, and You Better Watch Yourself; the slow-building waves of intensity in Dust Bowl; the haunting Bird on a Wire; the Zeppelinesque Blue and Evil; the melodic Mountain Time; the eeriness of The Ballad of John Henry; the pure joy of Bonamassa and Clapton in Further On Up The Road; and the power of The Outsider and I Can See Your Spirit from the Black Country Communion chapter. My wife and I just saw Joe for the first time last Friday at the Ruth Eckerd Hall in Clearwater Fl. Having been a fan for a number of years I thought I knew what to expect from the concert. I could not have been more wrong. He started out with an acoustic set reaching deep into the roots of Blues and spread it out from the Mississippi Delta to the northern Appalachians and then dug deep into the coal mines of Kentucky. The instruments on stage were a mix of cultures and added a feel that made this part of the show. They included a Celtic Drum, mountain dulcimer with a bow , a fiddle and a banjo. Not instruments you would expect to see at a Blues show. When they opened the electric set, I found myself sitting there with my mouth hanging open. We will remember this as one of the best concerts of our life. My favorite song had to be “Ballad Of John Henry” although it was a tough call. The only thing that made it my favorite was the accompanying light show where it appeared that a train was coming onstage behind the drummer. Wow doesn’t really say enough, but that is the first word that came out of my mouth and my wife’s mouth after the lights came on. We will definitely see him again! Ive seen Joe three times and each time he was more passionate, intense and a greater musician. The more i watched the further i fell into his hypnotic style of music that he calls ‘The Blues’.